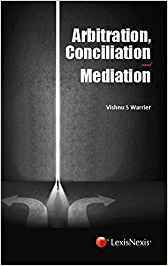 Arbitration, Conciliation and Mediation is specifically designed for students of the three-year and five-year law courses in India, including national law schools. It would also be useful for practising lawyers as reference material in this field. This book is an attempt to provide a compact, integrated text on Indian law in this field. Beginning with the history of arbitration law in India, the text describes the Arbitration & Conciliation Act, 1996. It then describes arbitration tribunals, arbitral awards, enforcement of awards, termination of proceedings, appeals, conciliation and mediation, and supplementary provisions.